After getting in touch with Brazilian designer and site-creator Fabio Giolito last week, I want to commend him here on the fantastic contribution he has made to the worldwide web on behalf of artists, designers and photographers everywhere. Many of you who are already in-the-know will understand exactly how I feel: if with a similarly relentless inclination towards all things of strong visual character and aesthetic appeal, this is the holiest of holies when it comes to online tools absolutely worth using. Even in a way I feel that giving him honourable mention is nowhere near enough to fully express my gratitude, but spreading word of Giolito’s work to other like-minded individuals is nothing short of an obligation. As someone who is well-versed with the mechanisms of Delicious, Digg, and the various bookmarking platforms available, We Heart It comes as a breath of fresh-air after having long been seeking a solution to the indexing of favourites and organization of image data after having found conventional methods entirely insufficient in capturing visual content. Thankfully it seems the days of saving JPEGs in an allotment of folders (only to then have to go through everything once having realized a particular image is needed) are now finally over. Using the ubiquitous tagging feature found on WordPress and virtually every site around, image indexing and categorization is enabled via the easy addition of the purpose-built ‘I ♥ IT’ bookmarklet (unfortunately not yet compatible with Internet Explorer, though perhaps you might be better off using Firefox anyway?). Once added, you can simply click on it whilst browsing, automatically marking recognized images on the page in We Heart It’s signature pink, allowing you to select which to add to the collection in your account, a.k.a. ‘your heart’. You can browse fellow users’ images as well and, interestingly enough, it therefore provides a wonderful way to learn more about the visual taste of those around you in a manner similar to Last.fm giving you the opportunity to enrich your music-listening experience through the ‘neighbourhood’ principle. Truth be told I happened upon Giolito’s creation quite by chance, but now I can’t possibly imagine the net without its use. Suffice it to say that searching through saved images is now just as easy as it is to look up words in articles; and finding visually similar, topically related images is even easier. Having reached its milestone of 10,000 users almost exactly a month ago, it looks as though We Heart It is here to stay, and so much the better. I feel strongly that no one who holds an appreciation for the arts and design should miss out on this marvel for either purpose of work in design, research and inspiration, as well as personal pleasure in the appreciation of the work of others in the visual arts community worldwide. We heart it? Thanks for sharing. This is one of its kind where images are bookmarked. I will visit the site now. I can’t begin to explain how happy I am after reading this. 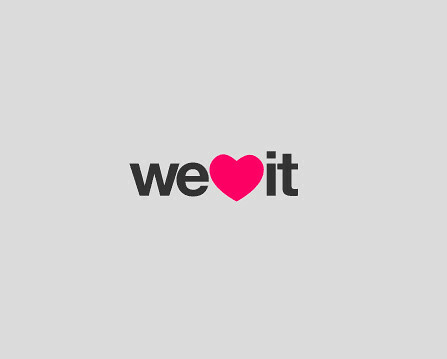 Thank you for your love for weheartit, and for sharing it with your readers!